As a team, Knowledge Quarter Liverpool occupies the dynamic space between ambition and delivery. We are defining, creating and promoting the place. Liverpool is a city of opportunity, however, it’s fair to say that it’s assets and strengths in science and health are little known beyond the boundaries of the Knowledge Quarter. It is, therefore, important that we work to reposition Liverpool and it’s Knowledge Quarter at the forefront of global innovation, ultimately growing the economy and creating new employment. KQ Liverpool brings together the city’s key partners to collaborate in a creative environment – making the whole greater than the sum of its parts – with the capacity to respond quickly to opportunities. This will help to make The City Region a focus for innovation and KQ Liverpool enables consistent messaging; it becomes the single point of contact for investors and through the ‘power of place’ fosters clustering and knowledge transfer. 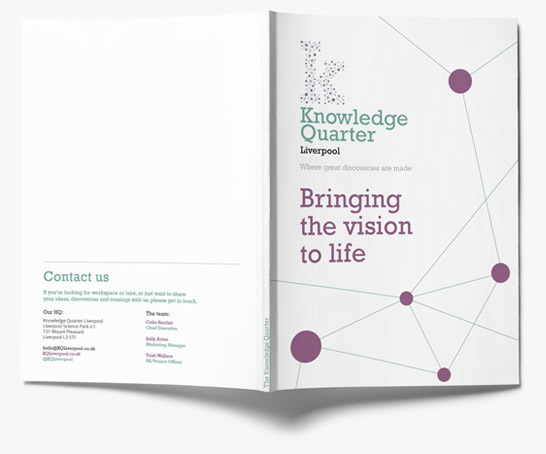 The KQ Liverpool board consists of Liverpool School of Tropical Medicine, the University of Liverpool, Liverpool John Moores University, The Royal Liverpool and Broadgreen University Hospitals NHS Trust, Liverpool City Council, Liverpool Vision and The Hope Street Community Interest Company. Each of the partners offer differing areas of expertise, share the same vision and are collaborating to achieve the same goals. This is the key to the success of the Knowledge Quarter.